Two properties with over 800 satisfied guest groups for 10+ years. We are the consistently the highest rated properties in Muskoka. 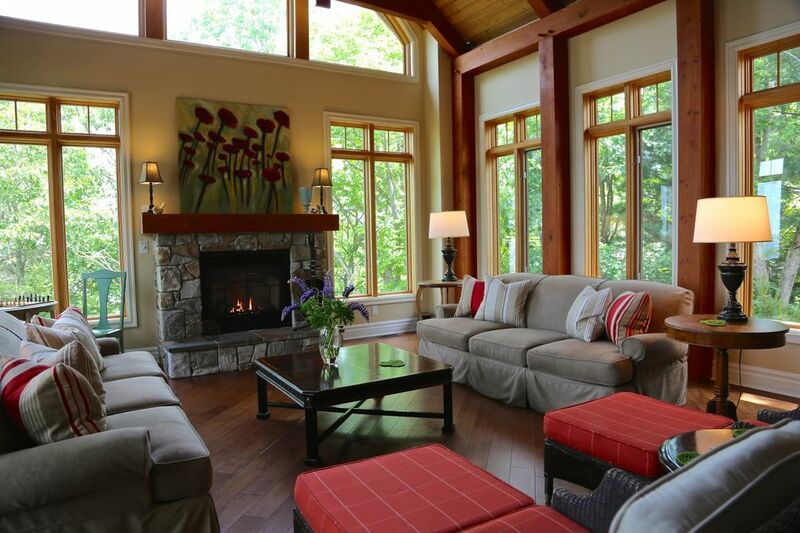 Make the most of your vacation by choosing the right property with Muskoka Soul. See Muskoka Soul in Press the perfect family retreat in Family Fun Canada & Find Muskoka Soul in Financial Post Magazine. Summer '19, 70% BOOKED. On our site, see more pictures and over 450 5-Star reviews. Custom built and designed with the guest in mind, The Lake House has 5 bedrooms & 3 bathrooms and accommodates sleeping for up to 10 people. Imagine yourself in a 3200 sq. ft, 2 story , Post & Beam construction with French Country inspired interiors with well thought-out spaces, carefully appointed bedrooms with super quality Innkeeper Beds and linens. The soaring great room with expansive windows overlooking beautiful Lake Muskoka, a chef's kitchen with huge granite island and stools for 3, beautiful dining area for 10 plus, TV Games room, library loft with books for kids and adults, and much, much more - all to insure your complete comfort and enjoyment. The large cedar deck with Gas BBQ with dinning for 10 overlooks a granite patio with fire pit, gardens and Lake Muskoka. Two large docks with deep water swimming provide great boating access to the Big Three lakes and Muskoka Bay Wharf. Finally when you arrive at The Lakehouse you will appreciate the house has been professional cleaned and set up for your arrival by a caring and dedicated team. Stunning, Wow and Amazing are often the first text messages we receive on guest arrival. What will you say? Guests have options with Muskoka Soul. Book via Canada Stays/VRBO/HomeAway or contact directly where no booking fee applies. You decide. Looking for summer 2019 - contact direct for peak week availability. We worked to ease your escape, rates include cleaning on departure, crisp white 100% cotton bed linens, white bath towel sets, basic house supplies & a supply of paper goods. Added benefits for our guests include direct line to propane for the BBQ, high-speed multi-user wireless internet (not DSL) and on-site garbage removal. Just a few added benefits to simplify your travel. Want to hear more about Muskoka Soul, see the press profile in The National Post - Financial Post Magazine, Family Fun Canada and Muskoka Life. At Lake House: 48 ft. cantilever dock for deep water diving and boat docking of any size. The side dock provides a shallow rocky entry and afternoon shade. At Lake House: 50ft. shoreline dock with a t-shape extension. Enter onto soft sandy and shallow water and drive into a the deep bay off the end of the dock. Our water front location offers access to a Canoe, Kayak & Powerboat rentals from nearby preferred suppliers. Air Conditioning at the property is a fee for use flat rate service. We believe clear, helpful communication is an essential part of a great guest stay and this is exactly what we want for our guests at Muskoka Soul. Please take time to read the following and ask us questions. We are here to help, please be sure to contact us during your stay if you have a challenge or something is not working. House keeping includes at total of 6 HOURS of cleaning time to focus on changing linens & cleaning. All linens are rented and included in the rate. If the cleaning time exceeds 6 hours the cost for added time will be passed on at the rate we pay $35/ hour from our local supplier. What can increase time is: 1. food left behind 2. garbage & recycle not removed & processed as per the town requirements. 3. dishes/ bottles/cans/ garbage left around the house and outside the house 4. furnishing/ pillows /blankets moved from rooms and not returned from the room of origin. 5. Unwashed dishes. Please load and start the dishwasher(s) before you depart. SECURITY SYSTEM During your stay if the fire/police department is dispatched based on a false alarm, the fee for a false alarm from the Town of Gravenhurst will be passed on. At the alarm panel located at the front door. The use of FIRE WORKS or PELLET GUNS ARE NOT PERMITTED. 1) Hosts were very gracious and helpful. 2) House was absolutely beautifully built, outstanding attention to detail. 3) Equipped with EVERYTHING you could think of. We have stayed in many rental properties before, none had such thoughtful little touches like a phone charger and extra supplies. Our water front location offers access to a Canoe, Kayak &amp; Powerboat rentals from nearby preferred suppliers. HST Number 85584 7976 Guests have options, book via Canada Stays and pay the booking fee or direct no fees apply for detailed rate information. 2017 rates on our website Full service rates that include CLEANING on departure, complete linen service (white cotton sheets and white towel sets), &amp; paper goods. Summer stays by the week, selected high demand weeks are two week stay with arrival on Friday Weekend bookings Oct. to May are a minimum 2-night stay; Sept. &amp; June 3-night stay on weekends High Season Rate on Holiday Periods with a 3-night minimum - Family Day, March Break, Easter, Victoria Day, Thanksgiving, Christmas, News Years.